Oh my! Cover or no cover. @melinda: Me too, I love Toto for some odd reason. I wondered whether Africa By Toto By Weezer was going to get an airing this afternoon. Pseu, you're still the best thing about this Tuesday, even on the Tuesday when this cover was unleashed on the public. Why does this song give me chills? Why?? I get Weezer and Ween confused. The fear of an acute all-day earworm led me to tune out during Africa. I know myself. I detest both Weezer and Toto but that cover was alright! Did anyone else hear some melodic part of that Azalia Snali and hear the chorus of Rancid's Time Bomb, think a cover of that was in progress? @Jeff: You might be suffering an aneurysm. It's now weird to hear Africa with no shittyflute, but those Weezers did a pretty nice respectful cover. I was singing my own parody of this Dodgy song the other day1 "My life is effed for the summer..."
In a yoga class I heard a version of "Africa" with traditional African instrumentation: it was absolutely obscene. Pseu, play some Christopher Cross at some point to blow these hipster’s minds. Now I'm going to look for a cover of "Hold the Line." I wonder if Juliana Hatfield has one. This Duncan Browne track is great, but it sort of reminds me of a seventies version of Kirk Van Houten's deathless classic "Can I Borrow A Feeling?" I know it's a crazy request but many months ago you posted a video of The Smithereens doing very early track, "Some Other Guy," (not to be confused with the Beatles cover, which they also did.) and I can't find it ANYWHERE! Any clue how to find it?! Thanks from a loyal follower! Can't find the *video anywhere. Greetings everyone. 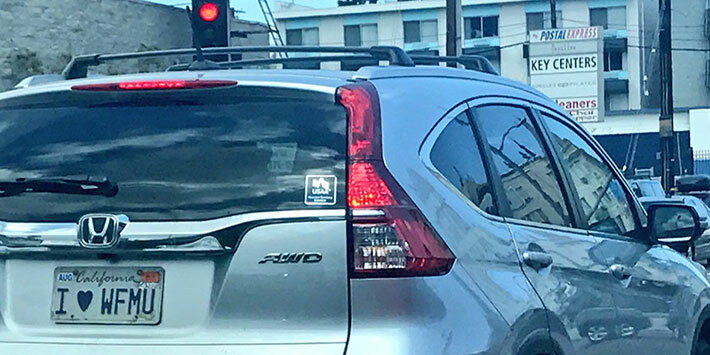 Driving around Pasadena this weekend, I saw a silver Honda CRV with a "I♥ WFMU" license plate. I tried to catch up to him but couldn't. So happy to see FMU love on the West Coast. That Honda has been in rotation in the main page GIF assortment lately. www.wfmu.org... Might have to click the right-arrow on the home page a couple of times to get to it. @ken from hyde park - I saw it in person! I did manage to get a photo of it too, but not nearly as good as that one. Phew! One person in California listens to WFMU! @middlebun - was that your car? I'm in San Diego but was up in Pasadena this past weekend as a vendor at the LA Zine Fest. I did have a guy stop me in San Diego because I was wearing a WFMU shirt. He was a New Jersey transplant. Car is nearly invisible 97 honda of nondescript color. Probably not. oh sorry Ken from Hyde Park, see you linked to it too! Heya Pseu and hookeroos. @Jake, lots of us in California are listeners. That was a lovely set, Pseu. Enjoying as ever to-day. I saw a person in a WFMU t shirt for the first time here in Maine last week. I already knew of some local listeners but it was fun seeing the shirt. Wow, a Left Banke tribute song! This reminds me of Eric Burdon and War due to its extremely freeform vocals and also Rage Against the Machine. Also African music in its chorus. Cool! Parquet Courts. This Chemical Brothers with the lady vocalist sounds a bit like Cowboy Junkies in her delivery. Knew there was Dead in the air...nice version. ooo! I like this Flower Machine. Thank you Pseu for helping get me through this Tuesday that feels like a Monday. Great show today. Great show!! Can you play any Dykeritz?? from "dreamer's whip"...new album is great, love your show!! Is this the big box store where you work, Pseu? Really digging this version of Kids in America. Ooh, thank you for the Robin's Reign! finish my day with tobin sprout. that will be just fine. thanks for the psoundtrack to my afternoon, pseu. Some teenage girl made it her mission to get Weezer to cover Africa. maybe a young woman. Anyway, she hassled them on twitter, and they covered some other toto song first (i think) to tease her, then finally covered Africa. you all probably know this by now, but if not... that's the reason this cover came seemingly out of the blue.